Man. There is just a ton of chocolate things out there! But hey, who's complaining? Here comes Chocolate Truffle Tea from Amanzitea, this really cool tea joint in Jersey. I made a beeline for it when they were handing out free samples and I gotta say it's pretty impressive. See I'm more a coffee person but I do like my black tea, especially if there's milk involved. The lowdown: it's a kind of black tea made with real cocoa and coconut shreds. 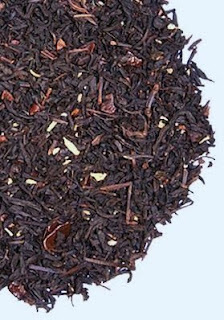 On its own the tea is unsweetened so you'll have to put some sugar or sugar substitute in it, and that's how it yields a sweet and creamy finish. Does it taste like chocolate truffles? Not quite, but it should nicely remind you of one. The store sells the loose leaf kind for $10.95 for a 4oz tin. A bit pricey, but it might make a chocolate fanatic or any tea lover happy. I have a feeling it would be fantasmic with milk. I am loving Amanzitea's blog, Tea Talk. Witty, informative, not to mention a genius marketing strategy. Check it out! Coming soon: Chocolate Wine, Chocolate Soda, and Belgian Chocolate Coffee (Hi, Wasim!). Lets get drunk on chocolate, shall we? I know, I know, I'm slacking on the chocolate coffee. I haven't been into the city in more than a month!